31 October 2008, at 8:43a.m. US - Tyson Foods marked the completion of a new wastewater pre-treatment system at its Monett poultry processing plant with a special ribbon-cutting event attended by community leaders on 28 October. Tyson built the $4.8 million system to replace the previous facility, which had been in operation for 38 years. The new system, which went on line earlier this month, enables Tyson to do more extensive pre-treatment of wastewater from the plant before it is sent to the city for final treatment. It should result in lower daily operating costs and provide additional pre-treatment capacity, in case it is ever needed. Tyson started making plans for the new pre-treatment system two years ago. The facility was constructed on Tyson-owned property near the Kyler Road viaduct. Demolition of some existing buildings at the site started in mid-2007, making room for two dissolved air flotation systems, an equalization basin and other equipment that essentially enables Tyson to double-treat wastewater from the plant before it goes into the city’s system. The site of the old pre-treatment system is now available for storage and other uses by the plant. Tyson’s Monett operations include a hatchery, processing plant and live production facilities in Monett. 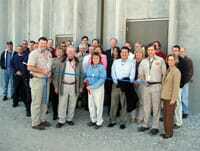 The company also operates a feed mill in Aurora. The complex employs almost 800 team members and produces fresh, ready-to-cook whole chicken and chicken parts for the restaurant and foodservice industry. The processing plant has been part of Tyson Foods since 1969.